A quick Google search using ‘Kim Jong Il’ and ‘fanatic’ as the terms brings up the following results: “Kim Jong Il: The Movie Fanatic”; “Kim Jong Il’s golfing accomplishments will never be repeated”; and “Farewell to a Fanatic.” The search also brings up a number of references to websites that include the word ‘fanatic’ in the title, more often than not in a positive context. It is a word that seems to emerge wherever there is an opening for strong opinions. In truth, ‘fanatic’ probably belongs somewhere near the term ‘genius’ on the list of generally devalued signifiers in the English language. As much as all language signals an intent on the part of the user, a need to communicate and, typically, a coinciding need to convince, the term ‘fanatic’ is one that immediately forces the listener or reader to take sides. Toscano’s introduction to Fanaticism: On the Uses of an Idea makes the specificity of his interests clear: “my principal focus will be on the various configurations taken by the idea of fanaticism in philosophy and theory” (xvii). This will be a book about the thinking of ‘fanaticism’, about its history of determination and the work of those who have tried to untangle and explain it over the history of its use. The determination of a label, a name, is something that can have profound consequences in the subsequent life of the object under analysis. To borrow a line from McLuhan, “The name of a man is a numbing blow from which he never recovers” (McLuhan, 35). The determination of a line of thinking as ‘fanatical’ carries with it this symbolic weight. As much as the term itself may live a relatively flexible existence determined entirely by historical and circumstantial properties rather than a clear etymological progression, the results of the application of the term are generally uniform. In all but a few (fascinating) examples provided by Toscano, the term ‘fanatic’ functions as a grab for political leverage. The application of the word generally serves to devalue a position before it is fully articulated and to grant a degree of invulnerability to the position of the accuser. Whether this works out in practice is immaterial – we tend to understand the term ‘fanatic’ as a rhetorical tool rather than as a label that requires immediate justification. Of particular interest for Toscano is an investigation into the ‘Enlightenment reloaded’ position and its endless proclamations against religious fanaticism. His text illustrates, rather convincingly, that the degree to which fanaticism is assigned to one party is often directly proportionate to the galaxy of unchallenged or unevaluated assumptions or convenient lapses of memory on the part of the accuser. It is not that a position, whatever that position might be, necessitates a certain inflexibility on the part of those occupying that position. Toscano’s point is that there appears to be a mechanism, a dynamic that accompanies ideological disagreements. This book, then, is about a repeated happening – a social event that has occurred across a variety of cultural and temporal planes – and the internal and external causes, conditions, and results of that happening. 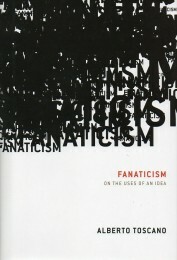 The purpose of Toscano’s writing is not to assign a predictive series of characteristics to the term ‘fanaticism’ but to investigate the way in which this label has either produced or become the symbol of reaction to human behavior interpreted by others. The social life of the terminology investigated here must be weighed amid the political events that were branded fanatical at the time as well as those that were assigned the term retroactively. All of this feeds into the realization that fanaticism, as a cultural and historical object, which is to say as something that has an existence that is built on the passage of time, is only meaningful in its intent. The decision to label something or someone fanatical belies an attempt to defend the opposing position. When used as a pejorative term, it is the closure of considered debate and the establishment of a binary relationship between groups. The approach of this book appears to be the treatment of fanaticism as a sort of tangible intangible; something that needs to be measured so that it might be understood. The historical examples and lineage traced – through Hume, Voltaire, Locke and others – are included in the text in the interest of a reckoning, a determination of what overall body of characteristics qualifies something to be described as ‘fanatical’ or for some specific person to attract the label. In this sense as well, the text is the investigation of how this relationship develops. How it is that a term that is an overt attempt to establish leverage, to elevate the esteem of one side of an argument independent of any substance, manages to maintain some sort of continuity in its application and its use? Toscano is talking about a maneuver, then. A bid for power that is rooted in language and the sole determination of success or failure depends on the altering of perspective. The barrage of synonyms we hear on a daily basis from politicians, news organizations and community leaders appears to have very little to do with the idea of fanaticism or the determination of what, indeed, a fanatic might be. Often, there seems to be a need to augment the thrust of the term with a preceding label – right-wing fanatic, religious fanatic, sport fanatic, etc. – or to circumvent the original signifier with another label that carries roughly the same contemporary connotations – terrorist, extremist, liberal, conservative, etc. Toscano’s text drags the focus back to the heart of the term itself; to what this designation means in a theoretical sense and what it creates on a practical level. The movement between an historical and evolutionary treatment of the presence of fanaticism and its theoretical groundings in application and determination manages to paint a much clearer picture of what is, typically, a term that hides its meaning in plain sight. There is an obvious timeliness to this book. Contemporary political and social discourse consistently leans toward binary definitions of what are, in truth, nebulous and inherently malleable social designations. With that in mind, the majority of political dialogue commonly leans in the direction of these types of binary determinations. The degree to which the label ‘fanatic’ is applied often reflects the polarization of dialogue on a particular subject. To the extent that this process seems easy – that it seems to reflect the properties of a situation rather than connote a designative process itself – this book makes the term complicated. And, really, complication is what is needed in this instance. The most compelling thing about Toscano’s analysis is the illustration of how easily a label like ‘fanatic’ or an attribute like ‘fanatical’ is applied from a variety of different perspectives. The pliability of this term, the ability to match it with wildly different ethos, determinations and even meanings speaks to the core of our understanding of political and theoretical vocabularies. It is precisely this pliability that gives the word ‘fanatic’ its currency. It is impossible to determine the meaning of the word without knowing its context, without determining the purpose of its being applied in the first place. This is the point at which ‘fanatic’ is comparable to a number of other labels and, really, this is where I find the greatest value in Toscano’s work. It is not so much the problematizing of a single collection of syllables (whatever language they may be uttered in) but the depth to which this one collection may be problematized that is of interest. This is a book that investigates the historical application, the historical evaluation and the theoretical history of the intent behind language in the abstract. The term ‘fanatic’ is one that is applied almost exclusively in political contexts and is one that derives its power from its inevitable establishment of a false binary in human relationships. It is a word that has some energy and force behind it. How has the idea, or the label of fanaticism been applied throughout time? What benefits are there to the use of it? To what extent can we say that language is always a political act and how does that politics function? In writing Fanaticism: On the Uses of an Idea, Alberto Toscano has drawn a map of an idea that is born and has perpetuated itself almost entirely through political language and a politics of language. This book provides a clear view of how power functions through symbolic methods and how perspective can be pre-determined according to rhetoric. This may not appear to be a revolutionary claim, but the depth to which the term is investigated, the way in which the argument forms around historical precedents and extensive theoretical investigation feels entirely unique. Toscano announces his intention to illustrate “fanaticism as a politics of abstraction, universality and partisanship” and does so with admirable depth and style. McLuhan, Marshall. Understanding Media. London: Routledge, 2003. Print. Jeff Heydon is an instructor at the Centre for Communication, Culture and Information Technology at the University of Toronto Mississauga and a doctoral candidate at Goldsmiths College, University of London. His research interests include media theory, surveillance studies, television studies and the politics of media culture.